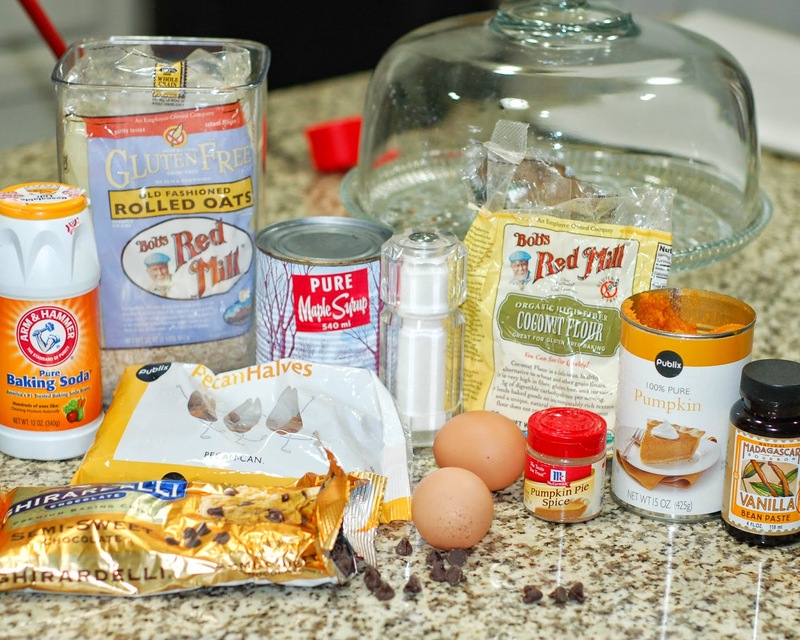 Last time I went up north for a visit, I had made her gluten free Maple Chocolate Chip Cookies with rice flour. This time I wanted to try coconut flour. I have varied the recipe a bit each time I made the cookies, playing around with the amounts of pumpkin versus oats until I got the right proportion. The original cookies were made with coconut oil, but the last time I made them I left it out and you know what? It totally worked. They came out perfect and tasted just as good. 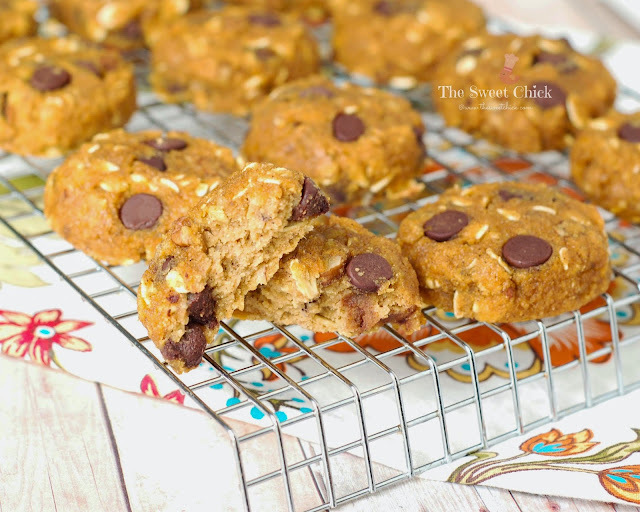 These Gluten Free Maple Pumpkin Chocolate Chip Cookies are filled with pumpkin puree and pumpkin pie spice. 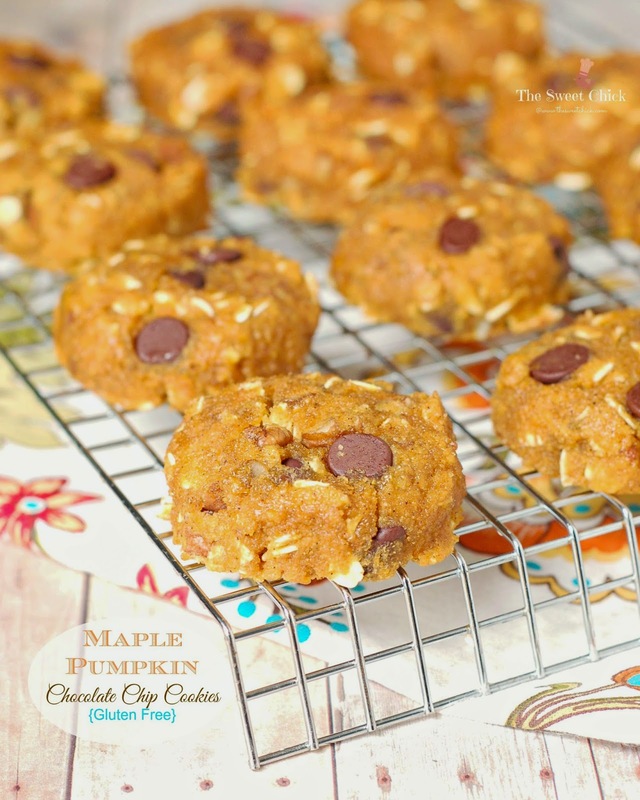 They are sweetened with pure maple syrup and chocolate chips. For texture, I added rolled oats and pecans. The cookies are soft and cake-like. They may look dry coming out of the oven, but once you place them in an airtight container, the outer layer becomes as moist as the inside. There is just the right amount of pumpkin versus spice ratio and plenty of sweetness. Take it from my four year old, these cookies are good. In a stand mixer, add the pumpkin, maple syrup, vanilla, and eggs. Mix on low until smooth. Then add the coconut flour, spice, salt, and baking soda. Continue to mix on low until well blended. Next add the oats, chocolate chips and pecans. Mix until all are well distributed. With a cookie scoop, place mounds of dough on parchment paper 2 inches apart. The dough will not spread during baking, so you need to press down each mound gently with your hands. 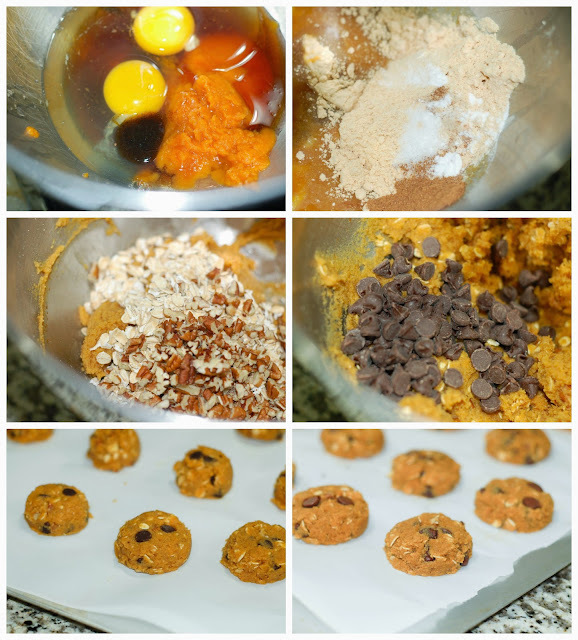 Bake at 350°F for 15 minutes or until the tops are slightly dry and the bottoms of the cookies are golden. Remove from oven and leave on cookie sheet for 10 minutes, then place on cooling rack to cool completely. I kept my cookies in an airtight container at room temperature for several days and they stayed the same. I have also frozen batches and then defrosted by simply placing them at room temperature and they were just as good as a fresh batch.